Now being developed as a television series with Eva Longoria and ABC! From a New York Times best-selling author, psychotherapist, and national advice columnist, a hilarious, thought-provoking, and surprising new book that takes us behind the scenes of a therapist's world - where her patients are looking for answers (and so is she). As Gottlieb explores the inner chambers of her patients' lives - a self-absorbed Hollywood producer, a young newlywed diagnosed with a terminal illness, a senior citizen threatening to end her life on her birthday if nothing gets better, and a 20-something who can't stop hooking up with the wrong guys - she finds that the questions they are struggling with are the very ones she is now bringing to Wendell. Maybe You Should Talk to Someone is revolutionary in its candor, offering a deeply personal yet universal tour of our hearts and minds and providing the rarest of gifts: a boldly revealing portrait of what it means to be human and a disarmingly funny and illuminating account of our own mysterious lives and our power to transform them. 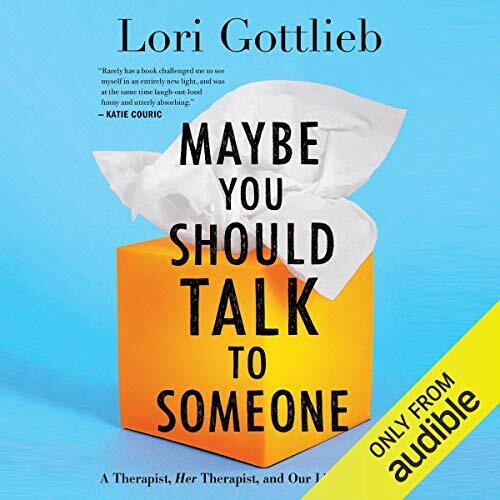 ©2019 Lori Gottlieb (P)2019 Audible, Inc. This is an incredible journey through the art of therapy —- told by a therapist who sees a therapist — and the lessons she learns from him and her patients through the years. Expertly crafted, funny, self-deprecating and brutally honest, this is a must listen. I laughed, cried and took deep breathes as Gottlieb wove her life’s work into a book that anyone in therapy or in pain will most likely find astonishingly illuminating in their own lives. I didn’t want it to end. I blasted through this book. I fell in love with Lori, identified heavily with her, her clients and the overall narrative throughout the book. I cried and laughed and reflected in my own experiences. If you’ve spent time in therapy or are a therapist I highly recommend. Loved it! I literally just finished listening to it and I'm considering listening to it again right now. It provides great insight into how therapy works and why anyone and everyone would benefit of seeing a therapist (the right therapist, that is). I think there is a take-away for everyone in this book. This book was comical, yet emotional on every level. I laughed, I cried, I hugged my loved ones a little tighter. A book that was written so well it played like a movie in my head. I could taste the Chinese chicken salad Jon brought into his sessions, I could hear Julie and her boyfriend laughing and crying together, I could see Ruby’s art, and I could feel every emotion expressed throughout this amazing piece of work. Thank you so much for sharing Lori. I loved this. Honest, laugh out loud funny at some moments, and other moments that had be bawling. Intimate without being overwhelming. Narrator was perfectly cast. I’ve already recommended this audiobook to other friends, worth a listen. It made me think seriously about how I talk to myself and made me want to hug my therapist. I enjoyed this book. Things wrapped up a little too nicely for me for everyone and the author and her clientele seem sort of elitist in general but it does show that we all have pain and suffering and we could all benefit from therapy which I honestly believe is true. And if you have never done therapy it does really explain the process (from waiting room to session to exiting) very clearly which I thought was very beneficial. I absolutely loved this book. Beautifully written, funny, soul crushing, uplifting, and will make you think about yourself in a different way. This book was insightful into the human condition, as the speaker showed us the compassion she had for others’ pain, as well as her own. The stories were raw and honest and so beautifully told. I thought of myself through the experiences of others and came out with a new hopeful perspective. The author clearly has such admiration for humanity and it’s complexities. I loved this book and read it all too quickly. I know you’ll enjoy it! I’m bummed this book is over. The way the author reveals her work in therapy and her work with her own clients made me forget I didn’t know these people. I appreciate the honesty behind each character and the way she says the things most people think but don’t say out loud. The narrator’s performance felt spot on throughout the whole book as well; adding to the story instead of distracting from it. Very very much enjoyed. I wanted to be a therapist for quite a while and ended up seeing one for the last four years. This is exactly what I wanted to know about how my therapist might see me or if she likes me. And I can see that she had her own real problems and that doesn't mean she's a bad therapist, her problems make her a better therapist.